April 25, 2014 (Lakeside) -- Ever wonder what compels someone to become a rodeo clown -- running in front of a charging bull? Mark and Cory Clement set out to find out in the debut edition of their new radio feature, "Wildest Jobs." 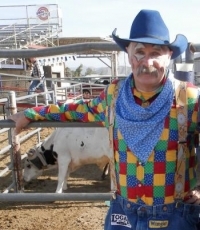 Hear a podcast of their entertaining and exclusive interview with a prominent rodeo clown at the Lakeside Rodeo Grounds, which originally aired today on the East County Magazine Show on KNSJ 89.1 FM. Just how effective is the new County Fire Authority at fire protection? While some areas have improved since the 2003 and 2007 wildfires,Craig Williams, an information technology specialist with Campo Fire Department shares shocking details on fire stations unmanned across our backcountry—and what could be done to keep rural residents safe. April 12, 2014 (San Diego’s East County) - The race for California’s 38th State Senate district seat has been heating up since the arrival of Fotios “Frank” Tsimboukakis. He has made it a point to challenge incumbent Joel Anderson on many key issues—including taking a stand against environmentally harmful energy projects in East County. Tsimboukakis has testified in public hearings against industrial solar and wind projects, as well as the Quail Brush gas-fired power plant, while Anderson has been largely silent on these controversial plans, critics have pointed out. Tsimboukakis has also proposed plans to make college tuition free, cut wasteful spending, and convene public hearings on funding firefighting, with an eye toward possibly repealing or amending state fire fees. He has also pledged to hold regular town hall meetings in the district to hear from voters, faulting Anderson for not hosting town halls for constituents to share their views. EAST COUNTY MAGAZINE'S FEBRUARY RADIO SHOWS ARE NOW ONLINE: LISTEN NOW! Our February 2014 shows are now online—including special reports on East County issues, holiday specials, interviews with top newsmakers and people making a positive difference in our community. Click here to listen now online and to read a list of our interviews and guest. Our guests in February included many local leaders, including Assemblywoman Shirley Weber, La Mesa Mayor Art Madrid, local authors, the Bayou Brothers, plus hear our latest investigative reports on issues ranging from wind farms to wildfires. You can also hear our one-hour show live when it airs on KNSJ 89.1 FM on Mondays, Wednesdays and Fridays at 5 p.m. and reruns Tuesdays, Thursdays and Saturdays at 9 a.m. Or listen live online during those hours at www.KNSJ.org. Read more about EAST COUNTY MAGAZINE'S FEBRUARY RADIO SHOWS ARE NOW ONLINE: LISTEN NOW! 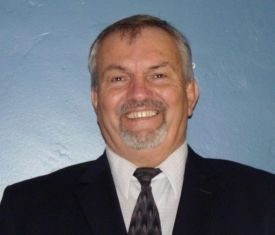 April 2, 2014 (San Diego’s East County) – Bishop Terry Angel Mason wants to bring his fiancé and their two adopted, orphaned children to America from Uganda. But his family is now in hiding –because of a new law in Uganda that criminalizes homosexuality and imposes a life in prison sentence on gay people, as well as anyone falsely accused of being gay. The law further requires that doctors, pastors, journalists and others inform authorities about the identities of gays and prohibits all discussion of gay rights issues. The law is fueling hate crimes, including beatings and burnings of gay people. Nor is Uganda alone; other African nations have also passed restrictive laws penalizing gay people, creating a climate of fear. Our January 2014 shows are now online—including special reports on East County issues, holiday specials, interviews with top newsmakers and people making a positive difference in our community. Click here for a list of our January shows and interviews with links to listen online. IS THE CITIZENS BOND OVERSIGHT COMMITTEE FULFILLING ITS WATCHDOG ROLE OVER THE GUHSD BOARD? Read more about IS THE CITIZENS BOND OVERSIGHT COMMITTEE FULFILLING ITS WATCHDOG ROLE OVER THE GUHSD BOARD? OUR DECEMBER RADIO SHOWS ARE NOW ONLINE: LISTEN NOW! Our December shows are now online—including special reports on East County issues, holiday specials, interviews with top newsmakers and people making a positive difference in our community. 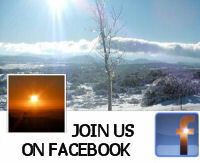 Click here for a list of our December shows with links to listen online. Read more about OUR DECEMBER RADIO SHOWS ARE NOW ONLINE: LISTEN NOW! Read more about EAST COUNTY MAGAZINE’S NOVEMBER RADIO SHOWS ARE NOW ONLINE: LISTEN NOW! EAST COUNTY MAGAZINE'S OCTOBER RADIO SHOWS ARE NOW ONLINE: LISTEN NOW! November 14, 2013 (San Diego's East County)--Our October shows are now online—including special reports on East County issues, interviews with top newsmakers, local musicians, authors, colorful characters and people making a positive difference in our community. Click here for a list of October shows and guests with links to listen online now. 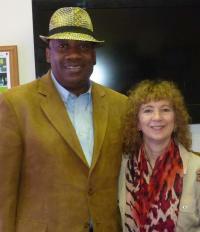 Read more about EAST COUNTY MAGAZINE'S OCTOBER RADIO SHOWS ARE NOW ONLINE: LISTEN NOW! East County Magazine's special report on the Cedar Fire, originally aired on KNSJ, is now online. Listen here: http://k007.kiwi6.com/hotlink/pla2tx46jk/ECMShow11-1-13CedarFireSpecial-FINAL.mp3 (It may take a few moments to load, so please be patient). Our editor, Miriam Raftery, covered the Cedar Fire back in 2003 for several publications and our own publisher, Mark Hanson, lost his home in Lakeside's Wildcat Canyon. Thus we were able to reconnect with a broad network of contacts to create our special report, which includes some never before told stories and interviews with fire survivors, firefighters and elected officials including Cal Fire Captain Mike Mohler, Lakeside resident Mark Hanson, Lakeside Fire Chief Andy Parr, burn survivor Rudy Reyes, Supervisor Dianne Jacob, San Diego Councilman Mark Kersey, Santee Councilman Brian Jones, retired Cal Fire Battalion Chief Mark Ostrander, Kathy Kassell, cofounder of the Cedar Fire Rebuild Resource Group, and other eyewitness stories from California’s worst wildfire ever. We conclude with reflections on what’s changed since then, as well as a reading from The Fire Outside My Window by Lindra Millers Younger. September 30, 2012 (San Diego's East County)--We had a great lineup of guests in September! Our radio shows are now posted, so you can listen to shows you missed. Below are links, along with a lineup of guests each day including Sheriff Bill Gore, Supervisor Dianne Jacob, climate change expert Eve Simmons, Noori Barka from the Chaldean American Institute, Van Collinsworth from Preserve Wild Santee, Helix Water’s Joel Scalzetti, and others including local authors, musicians, historians, and more. 1. On-air broadcasts of our show run Mondays, Wednesdays and Fridays from 5 p.m. to 6 p.m., and repeats Tuesdays, Thursdays and Saturdays from 9 a.m. to 10 a.m. on KNSJ 89.1 FM. 2. If you can’t hear the signal, you can listen live during broadcasts at www.knsj.org. Thanks to our talented cast of performers: Marie Johnson (Abigail Adams), Paul Kruze (John Adams), Leon Thompson (Chief Joseph Brant), John Falchi (Benjamin Franklin),Jake Christie (Patrick Henry), Mike Hancock (Thomas Jefferson), Dr. Kenmeth Hanson,(James Madison), Jason Smothers (Thomas Paine and King George III), and Imani Robinson (Phyllis Wheatley). Note: CDs of this presentation will soon be available for use by nonprofits and other organizations for a nominal donation of $20 to East County Magazine. Contact editor@eastcountymagazine.org. TUNE IN JULY 4 TO HEAR OUR RADIO SHOWON KNSJ 89.1 FM! July 3, 2013 -What could be more fitting than to launch independent media for our region on Independence Day? 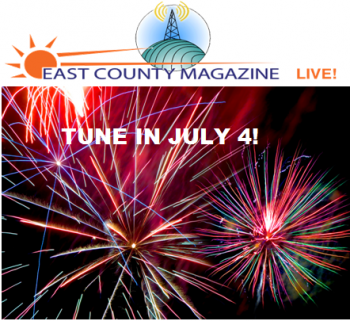 Our East County Magazine radio show starts tomorrow with two special presentations . Tune in and tell us what you want to hear on community radio! 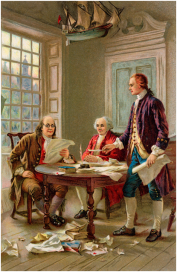 2 p.m., a special ECM-produced dramatic presentation--featuring "interviews" our nation's founding fathers--and mothers. Our July 4 show will be at the World Beat Center in Balboa Park, so if you’re in the area stop by to cheer us on! East County Magazine's regular radio program will launch next week, broadcasting on Mondays through Fridays at 9 a.m. and 5 p.m. Underwrite our show to support community radio and be heard across our region. Initial test signals for the new KNSJ station broadcasting in Descanso have been heard as far away as downtown San Diego, by up to a million listeners! Our show will air in prime-time drive time. Contact editor@eastcountymagazine.org or call 619-698-7617.